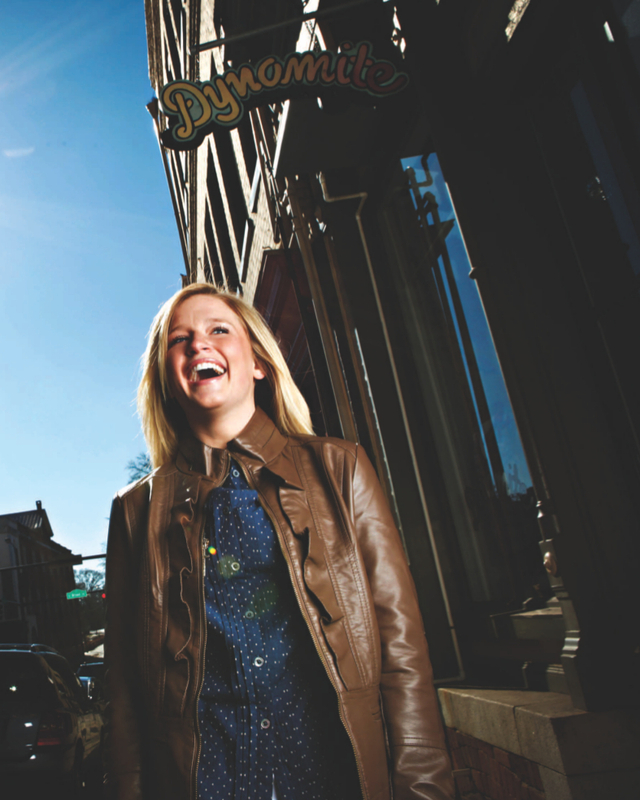 As a young and vibrant woman, Dana Nalley had no major dental health issues. Her teeth and gums were healthy. At the same time, she was not confident in the appearance of her smile. Dana had small open spaces between her teeth and she was especially concerned by the large space between a front tooth and the one directly beside it. Additionally, while her teeth were fairly straight, she felt like they were small in appearance. Despite her friends and family feeling it was not necessary, Dana wanted to make a positive change and decided to investigate veneers. As a sophomore at Gainesville State College, Dana Nalley was no stranger to homework. She had been interested in veneers for quite a while, but knew they were expensive. Dana began saving money and doing a bit of research. It wasn’t until she moved to Athens for college however, that she set about collecting information in earnest. Dana called at least 20 dentists. Wanting to make an educated decision, she would question the availability of the service, the process and the pricing. She made appointments with several dentists but was not satisfied with her experiences. The day Dana called Dr. Glenn Alex’s office, she knew right away that she had found the dentist she had been looking for. During her initial conversation with Leslie, Dr. Alex’s patient coordinator, she felt right at home. Leslie took her time and truly listened to her. She immediately scheduled a consultation appointment. Prior to her first visit, Dana was asked to fill out a questionnaire that would allow Dr. Alex to determine her wants and needs. During the appointment, they reviewed the questionnaire and clarified her expectations, hesitations and fears. “I did not want my veneers to make me look completely different. I wanted to look like myself, only better,” Dana explained. When she left her appointment, she had not reached a decision but was absolutely confident of receiving the best care. Dr. Alex took the information he had gathered from both her pre-appointment questionnaire and their consultation to create a treatment plan for Dana that included four veneers on her upper front teeth. He then utilized the photos and models taken during her consultation appointment to present his treatment plan. He had created digital images to allow her to visualize what her improved smile might look like and then contacted his dental laboratory, NuCraft Dental Arts, to create a three-dimensional, diagnostic wax-up on the models to further illustrate her possibilities. These tools convinced her, without a doubt, that this was something she wanted to pursue. Dana decided this would be a wonderful 20th birthday present for herself and scheduled the treatment. Prior to actually beginning treatment, Dr. Alex explained the necessity of involving his long-time laboratory partner, NuCraft Dental Arts. As he pointed out, “The ceramist [who makes the restorations] is a key part of the team from the very beginning, not once we are already underway with treatment. Our work is only as good as what our ceramist gives us and the ceramists work is only as good as what we give them.” “Many patients do not realize what an integral role the dental laboratory plays in the restoration process,” explains Terry Fohey, owner of NuCraft Dental Arts. Finding a dentist and laboratory that have a shared knowledge base between them is essential in the success of any treatment plan. As stated, Dana visited with NuCraft and met the entire staff. They too, listened to her concerns and discussed Dana’s options with her. When considering the shade (color) for her veneers, she expressed that she did not wish to have them any lighter than her present teeth because she wanted them to look natural. Dana conceded that it was tempting to want super white teeth but a friend had, regretfully, gotten very white veneers and everyone knew immediately, due to their artificial appearance. With this shared knowledge base and clear expectations, the laboratory was able to fabricate four beautiful, natural looking restorations for Dana. Her ultimate results speak for themselves. 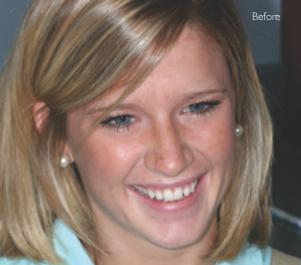 Despite their initial hesitations, her friends and family could not believe how much her new smile brightened her appearance and boosted her confidence. As a college student with no insurance coverage and a limited budget, Dana initially sought a dentist strictly based on fees. As she soon discovered, the value of good dentistry comes not in the fee alone but in the level of care offered to its’ patients. Therefore, despite her financial limitations, Dana was determined to find a way to make it work. 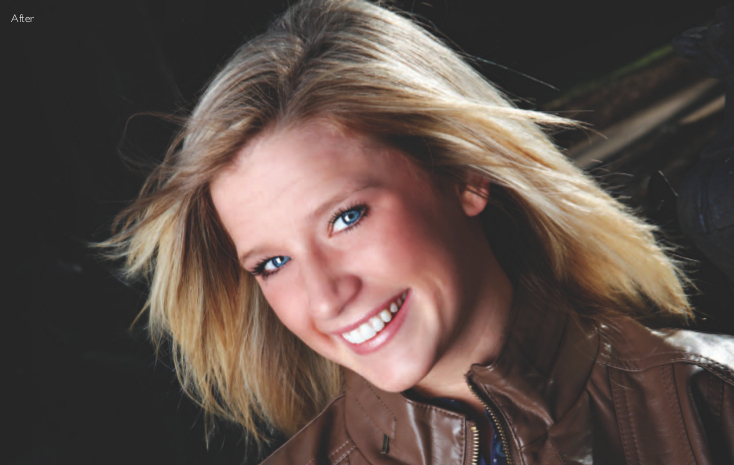 She chose to seek dental financing and was able to create a payment plan that worked within her budget.